The deadline for t-shirt orders is drawing near! Closing date for orders is midnight Monday 16th July. We are highly unlikely to have any left over to purchase at the con, so be sure to order if you want one! 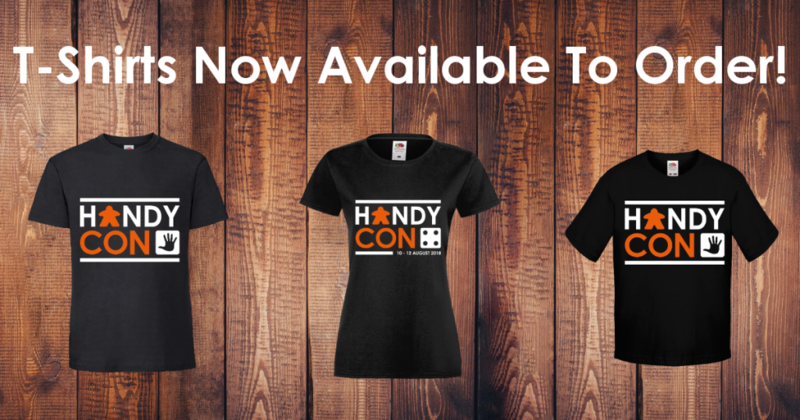 We have decided to offer two designs; one with just the HandyCon Logo and the other, limited edition HandyCon 4 logo design. We are likely to offer the Logo shirt at future cons whilst also producing a unique, limited edition design for each con. T-shirts are available in straight-cut, fitted-cut and kids sizes. For details on cuts and sizes and to order online, go to our webstore. The tournament and event schedule is now available online. Note that we may still add more, so keep an eye on the website and social media for any updates. “Going forward we’re going to make things a bit more polished in the competitive gaming department. Every year we will run 4 regular tournaments. Friday afternoon is the Little Spoon, a small game tournament accessible to all, played over 4 quick fire rounds. Later on is the Big Spoon; focusing on a bigger, longer game, this is for more experienced gamers looking for a challenge. Saturday afternoon is the Tour de Handycon, our regular Flamme Rouge grand tour. Played over 3 rounds, you can compete as a team to win the Faberge Pineapple, or focus on a great time to take home the coveted Chapeau Jaune. Finally, Saturday Evening is our showpiece, the HandyBowl! This is a special event which will take a game (or games) and add some special Handycon flavour for something a bit different, and the winners name will be added to the trophy every year. Each main event will have a special award to be presented on Sunday at the closing ceremonies, and there will also be bonus prizes to take home and enjoy. There are no entry fees for any of the tournaments, but if you have a copy of the game being played it would be amazing if you could bring it in case we have a lot of entrants! In addition to the bowly spooning, this year we are also running an 18xx Tournament (hosted by Colin Smith) and a Great Western Trail Tournament (we are just finalising how and when to run this, but will let you know the details soon). 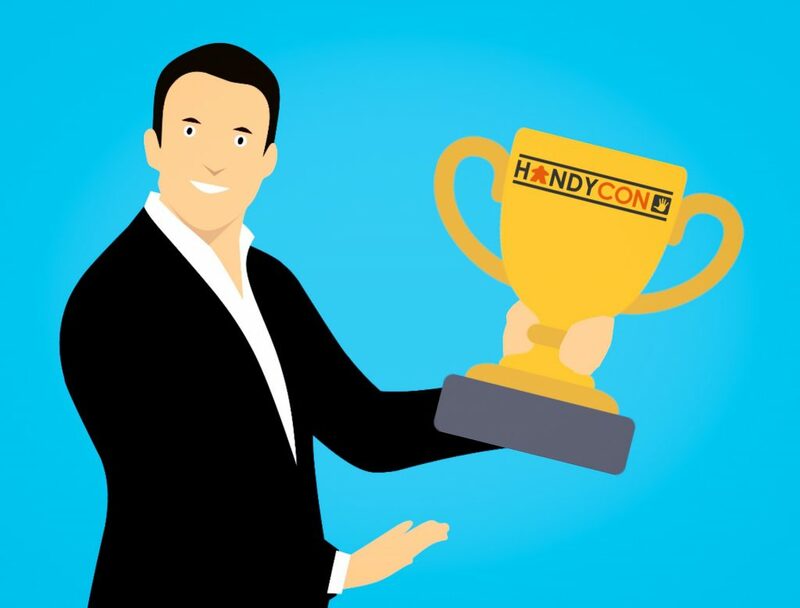 With regards to events, we are running Two Rooms & A Boom on the Friday evening and the HandyCon Mini-Games Challenge is making a comeback! Gaming Rules! is also hosting a Game Design Contest, the pitches for which are open to attendees and will be held on Sunday afternoon.